Best Cleaners’ 10th annual Coats For Connecticut community coat drive wrapped on January 16 with the last delivery of cleaned, donated coats made to Salvation Army centers and shelters in Hartford, Middletown, Meriden, Bristol, New Britain, New Haven, Bridgeport, New London, and Waterbury. This year, we collected a total of 15,000 coats between November 8 and December 22, bringing the 10-year total to 107,000. The total value of this year’s donated coats and donated drycleaning services combined is an estimated $425,400. Each year we are awed by the generosity of our customers, local schools, youth groups, and businesses who gather and drop off coat donations, as well as our campaign partners; the Salvation Army, Eyewitness News WFSB-Eyewitness News 3, Young’s Printing/FastSigns and Two Men and A Truck. The Salvation Army quickly distributed the weekly delivery of coats directly to individuals and families in need. WFSB promoted the campaign through public service announcements and coverage during various local news programming, in addition to collecting over 900 coats at the station. Young’s Printing/Fast Signs donated printing services for campaign posters, signage, and other materials. Two Men and A Truck came on board this year as a campaign partner, donating the use of two storage containers for staging coats and delivering coats to Salvation Army centers outside of the Best weekly delivery area. 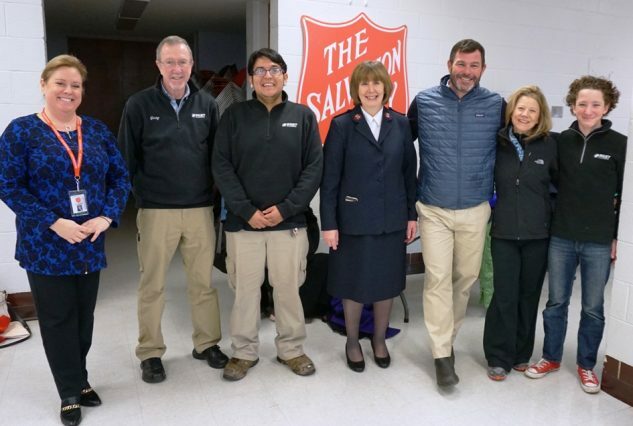 Pictured above: The Salvation Army’s Laura Krueger (far left) and Major Carol Duperree (center) join Best Cleaner’s Coats for Connecticut delivery team Gary Reynolds, Scott Franco, Shawn McCann, Laura Mullaly, and Kevin Mullaly.